Eadweard Muybridge was a Victorian photographer whose work transformed our understanding of the natural world. He was the first to show that horses gallop with all their hooves off the ground — and in this incredible photographic panorama, he reveals San Francisco in its infancy. 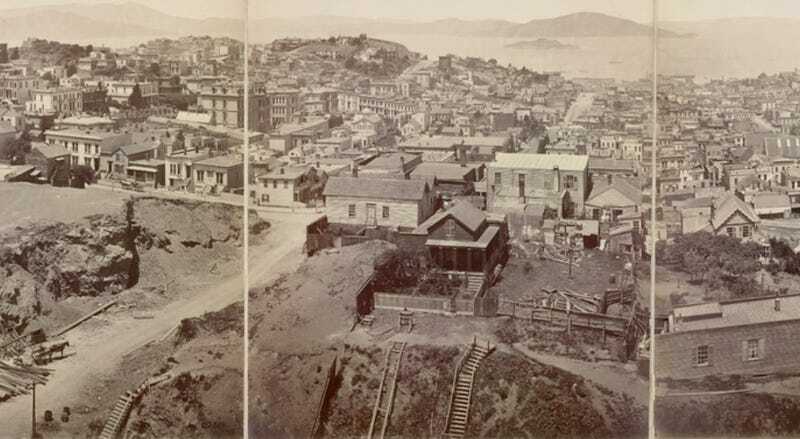 To understand how incredible this is, you have to visit the NYPL's digital archives, where you can see how Muybridge put together a series of photographs to create a complete, wraparound view of San Francisco. In this snippet of the panorama, you can see how the city looked from the top of California Street, on what today we'd call Nob Hill. Note that the city's famous hills were crawling with crazy-looking staircases that people used to climb home. You can view the photographs separately, or scan and zoom on the complete panorama at NYPL. It's fascinating to see this complete view of San Francisco at a time when the city was going through an economic depression right after it had expanded dramatically over the past few decades. The city had only about 5,000 residents before 1849, so you can see how the place changed over just over 35 years. Photography itself was in its infancy, and Muybridge's panorama was as much a scientific experiment as a record of geographical history. In 2008, two photographers recreated Muybridge's panorama using polaroids — you can see what that looks like here. Basically the entire horizon is blocked by downtown buildings.